FFS is the lead towage and marine contractor in the region. FFS together with the rest of the Submar group has sucessfully installed the biggest underwater resturant in the world. 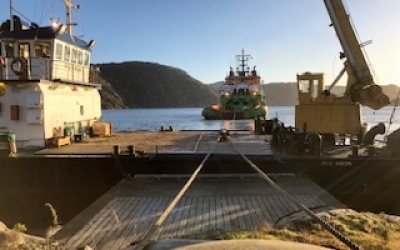 The Resturant was build on FFS PONTON 6 and transfered to floating by submerging the barge to - 15 meter below sealevel and then towed to position where it was finally installed on the seabed and secured. FFS has trough Submar group delivered a wide scope of services including Marine operations, equipment supply, seabed preparation, crane services and consultant. Just before Christmas AHT Boka Alpine was in for renewal of its Bollard pull Certificate. We thank Boskalis for the thrust and looking forward to see you again next time. Farsund Fortøyningsselskap was founded in 1982 with boatmen work for Elkem Lista, now ALCOA, and various shipowners for ships in layup. In 1991 the first tug and icebreaker was bought in from Sweden and a new segment was created. In 2018 the company merged into FFS MARINE to add a more international profile, but the people and knowlage is still the same. only the name is changed.